The candidates aspiring to become a teacher can apply for the admissions into B.Ed degree course offered by the Osmania University. The admissions will be offered on the basis of performance in the entrance exam conducted by the university. The interested candidates can apply for the admissions in online mode most probably from the month of December 2019. The candidates can find the important details related to the Osmania University B.Ed Admission 2019 (Distance) process such as exam pattern, eligibility criteria, application form, etc from this article. Given below are the tentative dates related to Osmania University B.Ed Admission 2019. The exact dates will be updated after the official announcement. The application form will be made available for download on the official website of the university www.osmania.ac.in or ouadmissions.com. An ICAR sheet along with the application form will be available for download on the website along with the application form. The candidates should carefully provide all the important information asked into the application form. Important information includes the personal and educational details of the candidates. The candidates must also affix their photograph and put their signature into the form at the specified places. After providing all the details into the form, the candidates must submit it to the university address along with the DD of prescribed application fee. A copy of the application form must also be retained by the candidates in case of future reference. The hard copy of application form and the demand draft must be sent via post or in person to the given address so as to reach before the last date of application submission. The application fee for Osmania University B.Ed Admission 2019 will be Rs. 500/-. The fee payment can be done via demand draft drawn on any nationalized bank in favor of the Director, Directorate of Admissions, Osmania University payable at Hyderabad. The minimum marks to be obtained at the qualifying exam level are 50%. The applicants must be serving as a teacher in a recognized Elementary/ Primary/ Secondary/ Senior Secondary school with a minimum of 2 years experience in school teaching. Marking scheme: 1 mark will be awarded for each right answer. The admit card to appear for the exam will be released a few weeks before the commencement of the test. The important details related to the exam such as center and time will be mentioned on the admit card. The candidates must carry the admit card to the exam center or else they will not be allowed to appear for the exam. The candidates should preserve their admit card till the complete process of admission is over. The result of the entrance exam will be announced in online mode and the candidates can check it by visiting the official website. The candidates who are declared as qualified will be offered admissions into the distance B.Ed course offered by the university. Merit list of the candidates will be prepared on the basis of their marks in the entrance test and they will be invited for counseling. The eligibility and documents of the candidates will be verified and the candidates will be offered final admissions after the successful verification. Candidates called for admission myst present in person and submit all the original certificates listed below, along with two sets of xerox copies. 1. B.Ed (Distance Mode) Entrance Hall Ticket. 2. 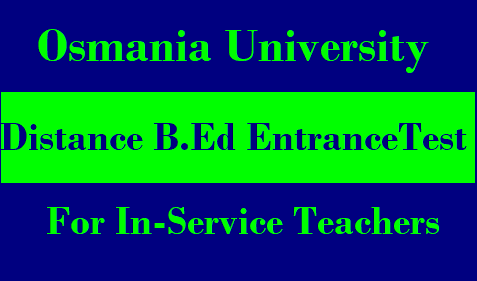 B.Ed (Distance Mode) Entrance Entrance Card. 3. Degree certificate (or provisional certificate if degree certificate is not yet issued as per rules)of qualifying examination. 4. Memorandum of marks (part-1 and part-2)of the qualifying degree examination. 5. Two years experience certificate. ii) Employee certificate from the employer. 8. Required course fee plus the counsellijg fee.